The Accipitridae are one of the two major families in the order Accipitriformes (the diurnal birds of prey). They are a family of small to large birds with strongly hooked bills (beaks). They vary accordig to their diet. They feed on prey items from insects to medium-sized mammals. Some feed on carrion and a few feed on fruit. The Accipitridae have a cosmopolitan distribution, being found on all the world's continents (except Antarctica) and a number of oceanic island groups. Some species are migratory. 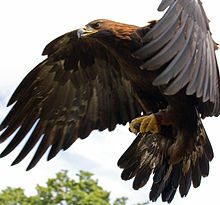 Many well-known birds, such as hawks, eagles, kites, harriers and Old World vultures are included in this group. The osprey is usually placed in a separate family (Pandionidae), as is the secretary bird. The New World vultures are now usually a separate family or order.